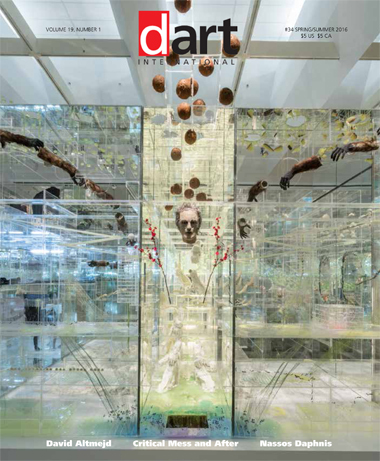 The Flux and the Puddle was the centerpiece of David Altmejd’s FLUX retrospective at Musée d’art contemporain de Montréal in Canada this past summer. 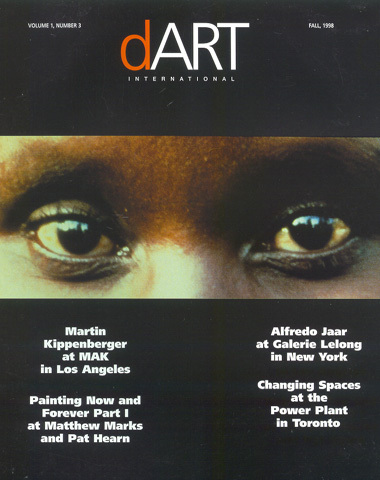 It was also shown this past winter at the Louisiana Museum of Modern Art in Humlebæk,Denmark. 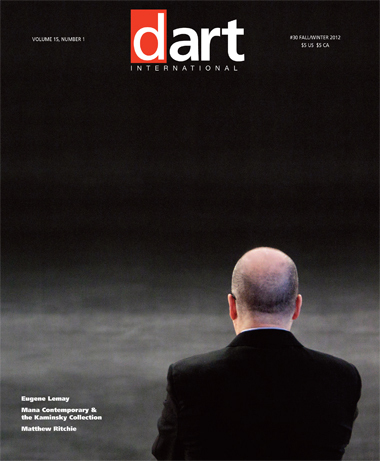 Emese Krunák-Hajagos reports on the Montréal exhibition. Critical Mess: Art Critics on the State of Their Practice, was published in 2006 by Hard Press Editions and edited by Raphael Rubinstein. It is comprised of 13 essays that include contributions by the late critics Arthur C. Danto and Thomas McEvilley. 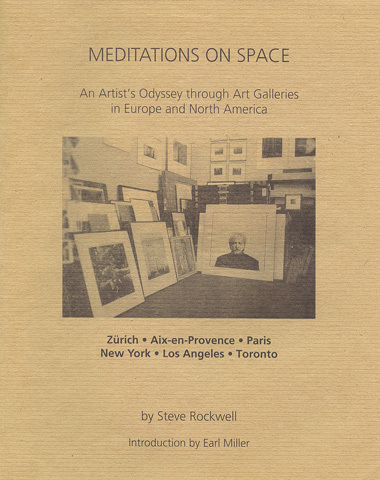 Steve Rockwell responds with his Continued Reflection on the State of Art Criticism. In the fall of 2015 the Richard Taittinger Gallery in New York City mounted the exhibition Pixel Fields, paintings by the late Greek-American Artist Nassos Daphnis. 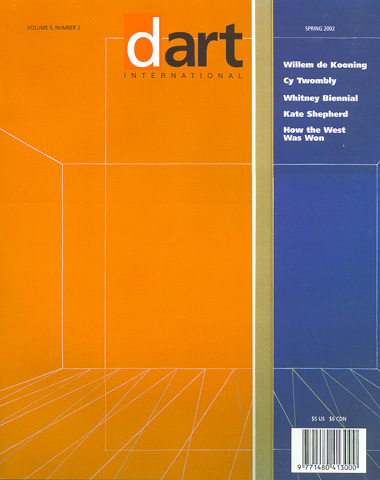 In his review of the exhibition Christopher Hart Chambers notes the inclusion of the artist in Wikepedia in their list of geometric abstractionists, a validating nod in recognition of Nassos’ contribution to abstract art. 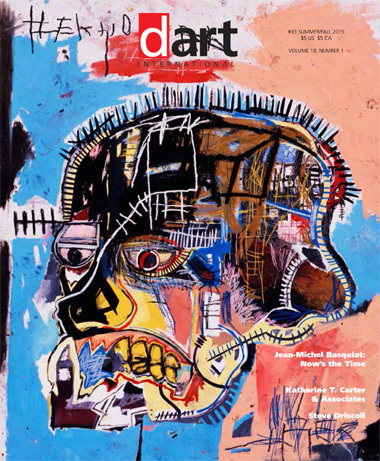 Jean-Michel Basquiat: Now’s the Time was the first major retrospective of the artist’s work in Canada, and was guest-curated by renowned Austrian art historian, curator and critic Dieter Buchhart. Steve Rockwell reports. Described as the queen of art exhibition, since 1985 Katharine Carter and her company KTC & Associates will have booked over a thousand museum, university gallery, and commercial space exhibitions across the United States. D. Dominick Lombardi speaks with Ms. Carter as her company nears its 30th Anniversary. Emese Krunák-Hajagos surveys the work of Toronto landscape painter Steve Driscoll in his exhibition, Smoke Show and Other Deceptions in Paint at Angell Gallery. 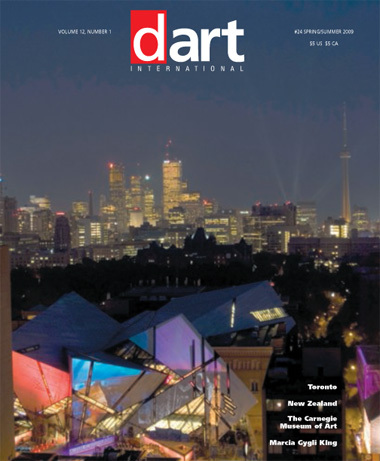 The tradition of the landscape as an inspiration to Canadian artists has experienced a regeneration in recent years with the influx younger talent. The exhibition Peter Doig: No Foreign Lands at the Montreal Museum of Fine Arts was a blockbuster’s blockbuster in the opinion of correspondent Veronica Redgrave. Created over the past 10 years, it showcased over a hundred works that included 40 major paintings. The return of formalism, particularly painted abstraction, has prompted Steve Rockwell to revisit our definitions of modernism and its post incarnation. References from the works of Francis Bacon, Peter Doig, and Stan Douglas have been helpful in his framing modernism from a broader perspective. 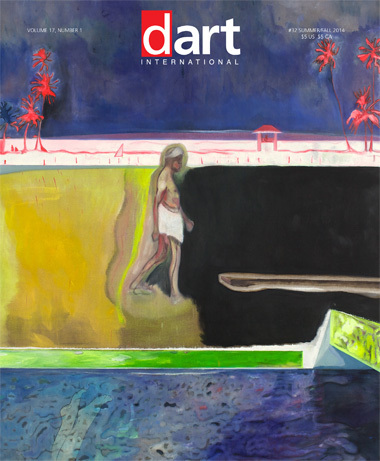 The Contact exhibition at the Honolulu Museum of Art School at Linekona in Hawaii was the display of a highly talented yet globally under-recognized art community. K&ocaute;an Jeff Baysa makes the point that it is the relative isolation of Hawaii which has been a factor in bringing this about. Carrie Mae Weems’ retrospective, Three Decades of Photographs and Video at The Frist Center For The Visual Arts in Nashville, Tennessee ran from September last year to January 2013. Curated by Kathryn Delmez, the exhibition, in the opinion of critic Edward Rubin, was provocative, thought-provoking, and timely. The Frist is housed in a beautiful Art Deco post office from the early ‘30s and has been mounting ground-breaking exhibitions since it opened 12 years ago. Emese Krunák-Hajagos reports on the show Nightfall/Alkony: New Tendencies in Figurative Painting at Galerie Rudolfinum in Prague, Czeck Republic and MODEM, Debrecen, Hungary. British curator Jane Neal grouped the paintings around five themes: Broken Landscape and Twisted Beauty; Portraiture; Struggle for Identity and the Hidden; Under Cover of Darkness; Painting and Cinema and Home but not Safe. Eugene Lemay’s Navigation exhibition at Mike Weiss Gallery in New York City is plumbed by Jeanne Wilkinson. She describes Lemay’s works as appearing "like visions; you imagine falling into them like Alice through a very dark looking glass". All the possible complexities of life: the physical, biological and socio-ecological are tackled by Matthew Ritichie in two bodies of work: Monstrance at L & M Arts, Los Angeles, Venice Beach and The Morning Line in Vienna, Austria, organized by Thyssen-Bornemisza Art Contemporary. Emese Krunák-Hajagos muses on Ritchie’s merging of physics, art, mythology, philosophy, religion and history and their artistic representation. This particular selection of works from Eileen S. Kaminsky’s collection of contemporary art is reviewed by John Mendelsohn. It is presented by Mana Contemporary, an art center housed in a former tobacco factory, which has been repurposed as 400,000 square feet of pristine space. 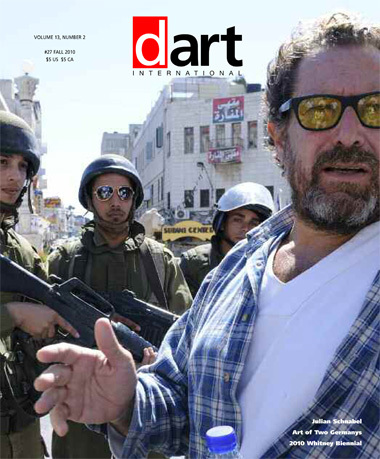 Mana’s mission also includes an artist residency program, and The Middle East Center for the Arts, which is devoted to art from that region’s many cultures. 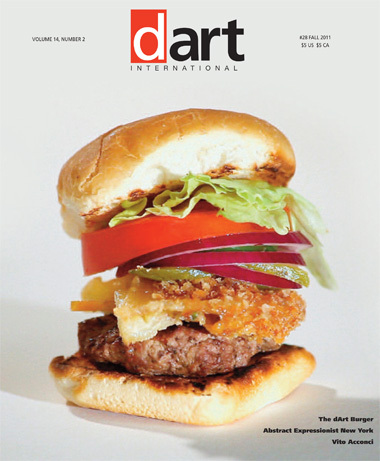 dArt magazine presents itself in edible form with the launch of the dArt Burger at De Luca Fine Art in Toronto. 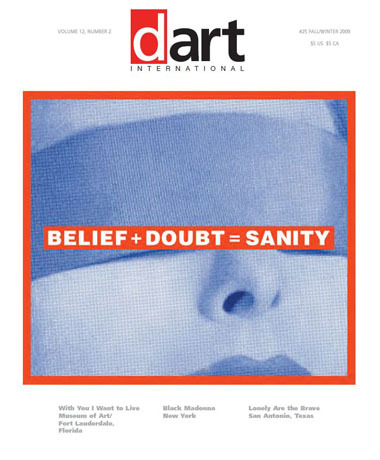 Publisher and editor Steve Rockwell draws parallels between the aesthetics of art and food with the mincing of dArt’s back issues. Drawing on its vast holdings, the Museum of Modern Art in New York displays the achievements of a generation that thrust New York City into the centre of the international art scene in the ‘50s. Emese Krunák-Hajagos surveys its showing in New York and at the Art Gallery of Ontario in Toronto. Bronx native and performance art pioneer Vito Acconci speaks with curator Karlyn De Jongh on his current interest in the integration of public and private spaces and its effect on the language of environments. Gap store founder Donald Fisher, a third generation San Fransiscan, started 14 collecting prints by Frank Stella and Roy Lichtenstein. Now after almost 40 years of passionate dedication, he and wife Doris are giving their collection to the San Francisco Museum of Modern Art on a 100 year renewable loan. 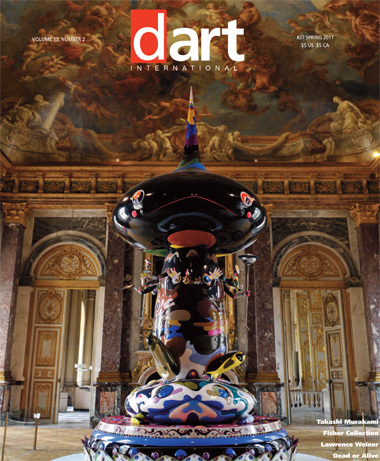 Takashi Murakami's exhibition at Château Versailles in France, of comic-based 19 manga and anime-inspired paintings and sculptures, has made headlines in the French press. Ed Rubin plumbs some of the issues behind the alleged ‘murder’ of classical French culture. Julian Schnabel: Art and Film is the largest showing of the artist’s work since 16 the 1987 Whitney Museum Retrospective. Curated by David Moos, the exhibiton surveys Schnabel’s work as a painter from the mid-1970s to the present and features some 60 works, along with his films. Ed Rubin speaks with the artist. Curated by Stephanie Barron, Senior Curator of Modern Art, LACMA, and 22 co-curator Dr. Eckhart Gillen, Kulturprojekte Berlin GmbH, Art of Two Germanys is the first special exhibition to go on view in LACMA’s new Renzo Piano designed-building, the Broad Contemporary Art Museum (BCAM). 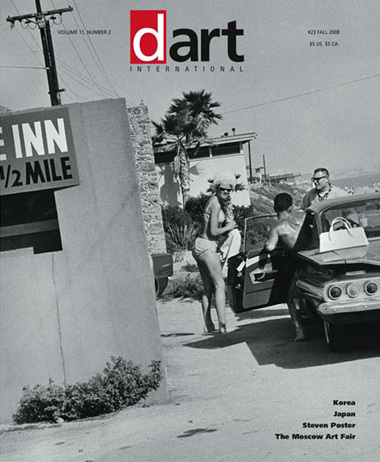 Emese Hajagos covers the Los Angeles installation of the exhibition. 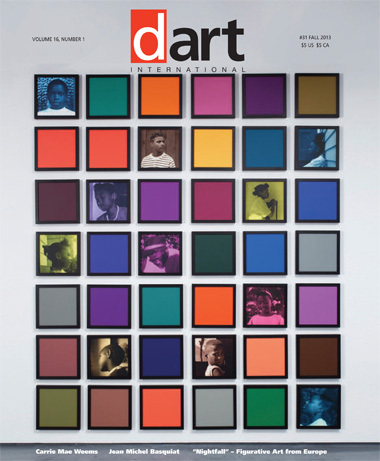 The 2010 Whitney Biennial in New York celebrated its 75th edition with 28 50 works – many textbook famous – and culled from past Biennial and Annual exhibitions. Edward Rubin wieghs in on the results by guest curator Francesco Bonami and Whitney senior curatorial assistant Gary Carrion-Murayari. Click here for the complete series on YouTube. Tony Calzetta and Leon Rooke and Widow Magazine, Peregrine Honig. Reviewed by Steve Rockwell. Edward Rubin steers into PINTA – The Modern and Contemporary Latin American Art Fair in the Metropolitan Pavilion and B. Altman Building in New York, where participating galleries have doubled to 60 from the previous year. After an absence of more than 30 years, D. Dominck Lombardi finds himself back in central Arizona with an eye for a contemporary art scene. After surveying museum and gallery exhibitions in Phoenix, Scottsdale and Tempe he is not disappointed. The choice top ten exhibits at the Miami Art Fairs in 2009 are selected and served up by Laura M. Cincotta, Erin Kennedy, and Douglas F. Maxwell. The Collections of Francie Bishop Good & David Horvitz, Gordon Locksley George T. Shea are the sources for this exhibition of 118 works by some 100 artists. Edward Rubin wades in. 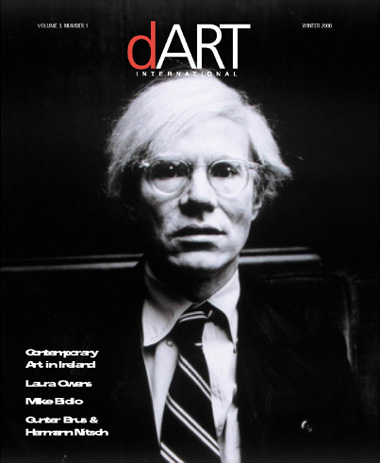 The Museum of Art/Fort Lauderdale, Florida is now the most visited art museum in Florida. Edward Rubin also dips his pen into the well of the Black Madonna exhibit at HP Garcia Gallery in New York, a multimedia exhibition of 41 international artists curated by Lisa Paul Streitfeld and H.P. Garcia. Luminaria was the launch of an all-day celebration of art, music, dance and theater in San Antonio modeled on Nuit Blanche in Paris. 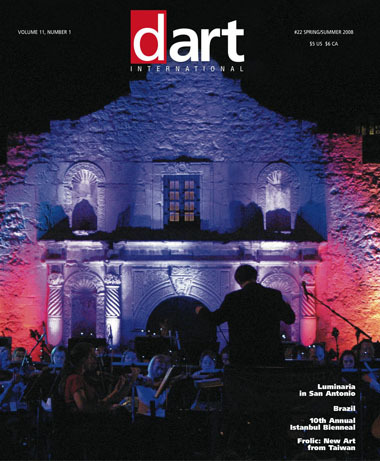 Culminating in a concert by the San Antonio Symphony and fireworks in the Alamo Plaza at midnight, the arts event shone a light on San Antonio’s rich and diverse cultural heritage. My Brazil Diary - In the summer of 2007 Earl Miller had "the good fortune to visit Brazil." He takes a first-hand look at an art scene that has recently garnered so much international attention in the art press and on the biennial circuit. At the 10th International Istanbul Biennial Janet Bellotto reflects on a city with a complex history and a growing art scene that is stirring the mix of international biennials. 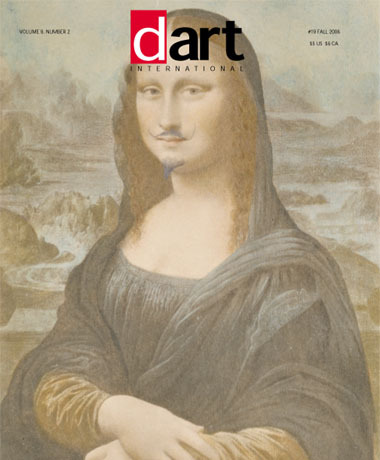 Himself a devout dada maven, Valery Oisteanu feasts on the largest dada exhibit ever, featuring more than 450 masterpieces by nearly 50 artists at new York's Museum of Modern Art. Gae Savannah hitches a ride on the seemingly ever-expanding caravan of contemporary art in New york that passed through the city this past March. She rode through Pulse, the Armory show, DIVA, ~scope, and the LA Art Fair. Curated by Janet Bellotto, Nature in the Garage features ten artists who utilize a garden shed to investigate and interpret conditions of the natural environment through various urban settings in Toronto. The paradigm between art and environment through this common cultural icon is explored by artists from Canada, Australia, Japan and Taiwan. 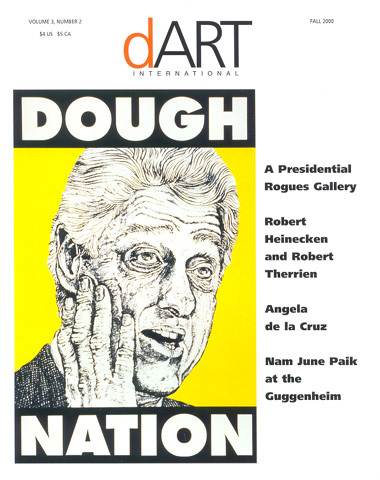 Group exhibition at the Lab Gallery, the Roger Smith Hotel in New York. Curators notes by D. Dominick Lombardi. Transmutations and Plastic Fantastic at SICA in Long Branch, New Jersey by D. Dominick Lombardi. Painting - Can You Take Me to Heaven? Kadar Brock at BUIA Gallery in New York by D. Dominick Lombardi. Sasha Chermayeff and Chuck Bowdish at Sideshow Gallery in Williamsburg by Jeanne Wilkinson. Sheila and Nicholas Pye at Kkasia Kay Art Projects in Chicago by Liam Rosewood. Light-based objects and installations aat the Anderson Gallery in Richmond, Virginia by George Cruger. Bill FitzGibbons' public art installation in an underpass in San Antonio, Texas, by Liam Rosewood. The paintings of John Brown at Olga Korper Gallery in Toronto by Gary Michael Dault. Steve Jones looks at the MFA arts programs at Virginia Commonwealth University and their remarkable ascent in ranking among colleges and universities across the U.S. Feature: Steve Rockwell. 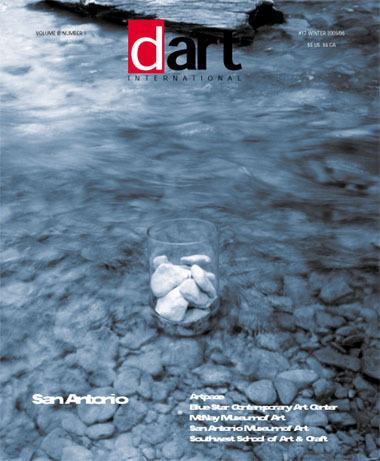 San Antonio, Texas: A Survey of Some of San Antonio’s Museums and Art Centers. I never got to ride on the carousel, aerial tram, nor on any horses for that matter, in Brackenridge Park, while I was in San Antonio. It would have been nice to go through the Japanese Tea Gardens with its winding walkways, stone bridges, and pools in what was once a rock quarry. No complaints. 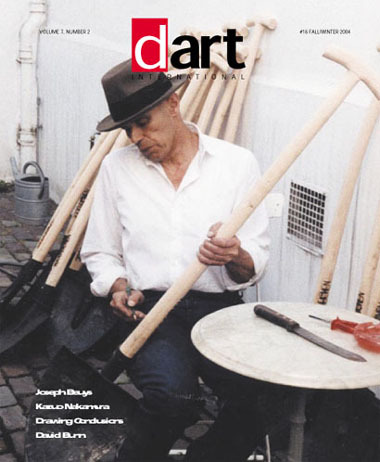 Feature: Bruce Bauman: Beuys Will Be Beuys. In my recent travels though LA and New York art venues the most arousing and enflaming work I saw was Tom Patchett's "stagewerk," which is built around the life of the late artist and cult celebrity Joseph Beuys. It is a work for those who do not know much about Beuys and for those who do; for those who believe there is a crisis in the arts and for those who do not. It should be seen by those who are Beuys fans and even more so by those who are not. I am one who did not know much, believes there is a crisis, and who was not a fan. Feature: Michael Goldberg: Wall to Wall, Coast to Coast. Peter Frank tracks the recent work of veteran abstract expressionist Michael Goldberg through three essentially simultaneous shows at art galleries in Los Angeles, New York, and Chicago. The Life Lessons of Don Giffen. With the passing of Don Giffen at age 53, Bruce Bauman celebrates the artist's achievements and life philosophy. Art making and art writing by the creatively ambidextrous are presented in a NY Arts Gallery show curated this winter by Jill Conner and Gae Savannah. 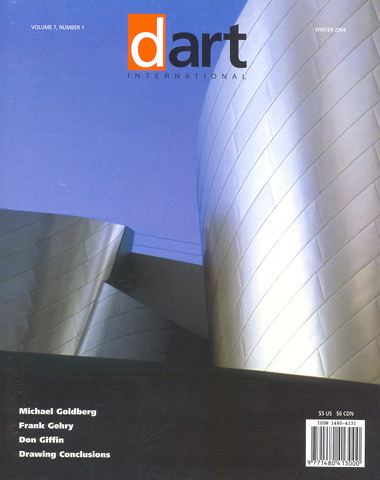 Frank Gehry: Works in Progress and Disney Hall. Clayton Campbell attends the arrival of Disney Hall and its musical inauguration with the Los Angeles Philharmonic. Jean Lowe at Rosamund Felsen Gallery. Group Show at Andrewshire Gallery. Walter Anderson at Luise Ross Gallery. Gé-Karel van der Sterren Henry Urback Architecture. Feature: The Art of War. In a contemplation of war and its metaphors, Bruce Bauman seeks solace in a journey through LA's galleries and museums. The Passions: Bill Viola at the Getty. Jody Zellen examines Bill Viola's quest to parallel the great masters' achievements in the range of human emotion using new technology. Glimpses of Arcadia: Laura Owens at LA MOCA. George Melrod reflects on the work of painter Laura Owens and her much-discussed position in contemporary art. Alfred Jensen's labyrinthine cosmologies continue to fascinate. Stacen Berg puzzles over his intricately-painted numerical systems Great Waves at the Metropolitan Museum. Tomoko Takahashi at UCLA Hammer Museum. Sherri Hatt Art Gallery of Mississauga. The art of Gottfreid Helnwein. Marianne Lovink at Definitely Superior Gallery. Interviews with Steve Shane and Gail Rothman. The participating galleries and sponsors. 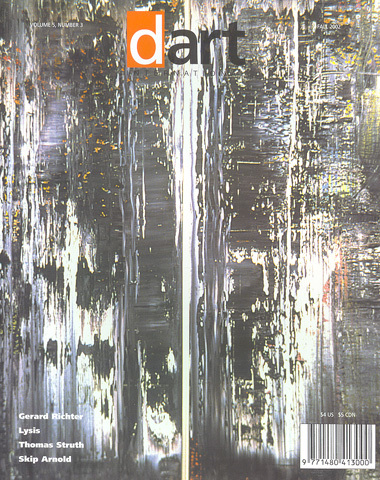 Feature: Gerhard Richter and the Empty Deep. A retrospective of Gerhard Richter's work at MoMA in New York inspires writer Bruce Bauman to reflect on the role of the art critic in contemporary society. Thomas Struth at MOCA in Los Angeles. Clayton Campbell surveys the photographic works of Thomas Struth and his commanding retrospective at MOCA in Los Angeles. Lysis: Profound Loss, Healing, and Identity. Curator Koan-Jeff Baysa tackles the themes of grief and catharsis with an exhibition at Pamela Auchincloss/Project Space. Dominique Nahas reports. Pollock to Punk: Skip Arnold. Los Angeles performance artist Skip Arnold speaks with Craig Stephens about the joys and stresses of his craft. Willem de Kooning: Tracing the Figure. A pictorial survey of drawings by the late Willem de Kooning at MOCA in Los Angeles, curated by Paul Schimmel and Connie Butler. Clayton Campbell introduces this grouping of drawings, which centers on the years 1952-53. The musings of American expatriate Cy Twombly on the 16th-century battle at Lepanto are displayed in painterly form at Gagosian Gallery in Chelsea. Robert Mahoney reports. Craig Stephens, based in LA, explores the emergence of Los Angeles as an art center in light of the continuing dominance of New York as the global epicenter of art. Feature: Jasper Johns to Jeff Koons. The Broad Collections. 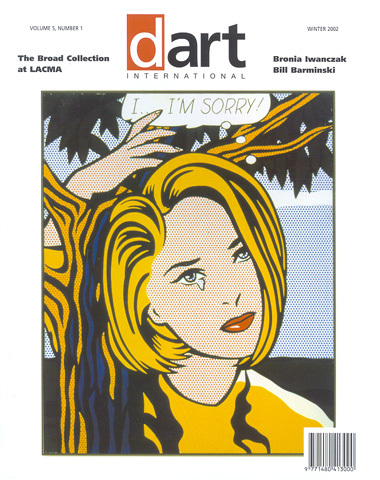 The LA County Museum of Art has mounted four decades of art from the Eli and Edythe L. Broad collections, deemed one of the top ten private art collections in the world. George Melrod reports. The Museum of Modern Art's presentation of Alberto Giacometti was the first major New York City museum exhibition of the Swiss artist in almost three decades. 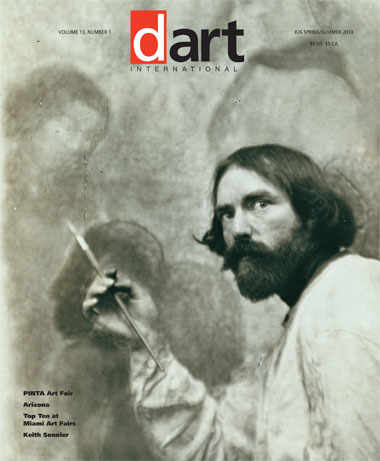 dART presents a pictorial survey of some the major pieces from this spectacular exhibition. The Australian installation artist Bronia Iwanczak presented Exit/Salida at Highways Performance Space and Gallery in Santa Monica as part of LA International last summer. Bruce Bauman delves into Iwanczak's probes of national identity and individual psychic borders. The Brooklyn Museum hosts a survey of Leon Golub's painting, often a gritty depiction of the world of mercenaries and terrorists. Jeanne Wilkinson infiltrates. In his first New York display since his participation in the now-infamous Sensation show, Ron Mueck keeps his focus on self and family with two works, a large mask and a small figure. Robert Mahoney explores. LA County Museum hosts Cuban photography after the revolution. Clayton Campbell views the work of three generations of Cuban photographers since Castro's ascent to power. 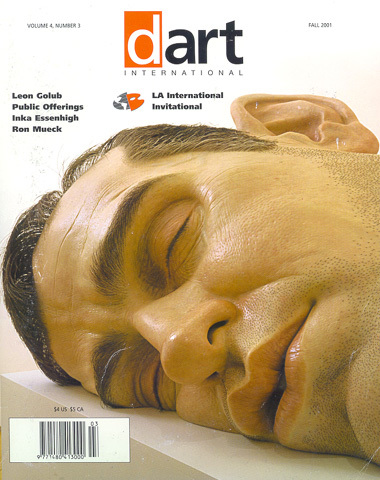 Public Offerings: MOCA at Geffen Contemporary. Clayton Campbell surveys Public Offerings, breakthrough works by young artists who achieved prominence in the '80s and early '90s. Clint Roenisch peruses a hundred More Famous Drawings by Winnipeg artist Marcel Dzama at Olga Korper Gallery in Toronto. A visit by Robert Curcio to Robert Longo's studio finds the artist continuing his fascination with drawing, a departure from his '80s work. Patrick Hogan: Requiem for a Heavyweight. Christopher Miles offers the work of the late Los Angeles painter Patrick Hogan for consideration and evaluation. Singular Fissions: Art in a Cold War Bunker. Canada's Cold War Museum, formerly a fall-out shelter, becomes the site for an international exhibition of 13 artists. Maureen Korp goes underground to report. Clayton Campbell surveys Superflat, an exhibition of 19 manga-influenced artists and designers at MOCA/PDC in Los Angeles. 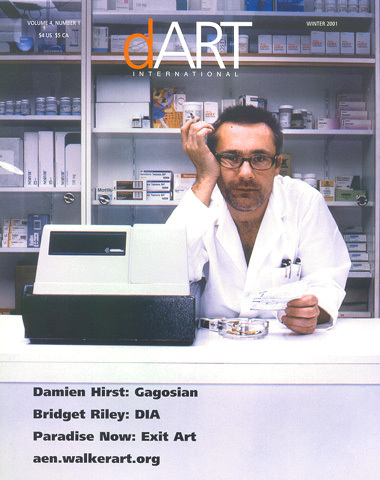 Feature: Damien Hirst Theories, Models, Methods, Approaches, Assumptions, Results, and Findings at Gagosian. Clayton Campbell considers Damien Hirst's recent work at New York's Gagosian Gallery in Chelsea and its impact on contemporary art . Bridget Riley's Reconnaissance at DIA. The maven of Op, Bridget Riley, and her linear legacy are examined by Jeanne C. Wilkinson, who covers Riley's shows at the DIA Center for the Arts and Pace/Wildenstein. Paradise Now: Picturing the Genetic Revolution. Dominique Nahas considers the impact of recent advances in genetic sciences on the art world through Exit Art's Paradise Now exhibition in Soho. The Walker Art Center in Minneapolis and the Centre Georges Pompidou in Paris collaborate on a web portal. Carl Skelton surfs. Rick Prol reflects on the tumultuous flowering of New York's East Village art scene, and his connection to some its luminaries. Dominique Nahas surveys the work of Nam June Paik, one of the seminal figures of media-based installation art, at the Solomon R. Guggenheim Museum in New York. Two to Consider at LACMA. The work of two LA-based artists, Robert Heinecken and Robert Therrien, is considered by Clayton Campbell at their recent exhibition at the LA County Museum of Art. Robert Curcio "discovers" the work and person of London-based artist Angela de la Cruz. Feature: Drawing the Line -- The Gentle Purpose of Laura Owens. The work of Laura Owens is examined in light of its "purposiveness" by Los Angeles writer Jan Tümlir. Ireland's Artists and the Celtic Tiger. Clayton Campbell surveys Ireland's contemporary cultural scene and the emergence of a new generation of visual artists. Cawfee Tawk with Mike Bidlo. Robert Curcio looks at the appropriation art of New York artist Mike Bidlo and his recent St. Duchamp series. Dominique Nahas discusses the visceral art of Viennese Actionists Gunter Brus and Hermann Nitsch and their recent exhibition at White Box in Chelsea. Sadie Benning, Mark Bradford, Sean Landers, Julie Becker, Jack Pierson, and others are featured in an installation curated by Sima Familant at Greene Naftali in Chelsea. Carl Skelton reports. Feature: LA at the Edge of Time. For a host of reasons LA has vaulted into a position as the new megalopolis, a megacity of the 21st century characterized by decentralization and the lack of a clear ethnic majority. Feature: The New Color Field, an Acid Test. How does the recent flowering of the Color Field hold up against the movement's roots? Michael Duncan peruses the field to suggest a widening in the spectrum of current contributors. Diana Thater's Flat Animals at MoMA. Carl Skelton tracks Diana Thater's camera movements through the Project Room at the Museum of Modern Art of her installations, The best animals are the flat animals and The best outside is the inside. Jackson Pollock Returns to MoMA. Dominique Nahas weighs the impact of Jackson Pollock's contribution to modern art against its blockbuster presentation at the Museum of Modern Art in New York. April Kingsley has found perfection to be a persistently recurring theme of contemporary art and explores its manifestation through eight recent New York exhibitions. Changing Spaces at the Power Plant in Toronto. 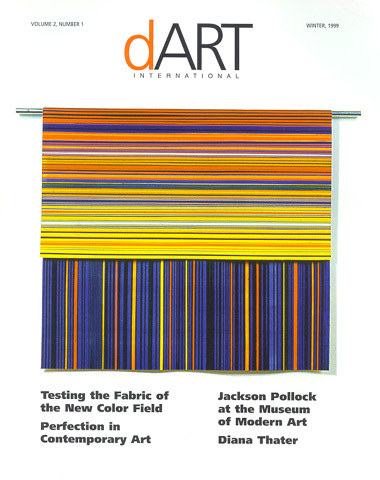 Corinna Ghaznavi examines Artists' Projects from the Fabric Workshop and Museum in Philadelphia. Chris Burden, Felix Gonzalez-Torres, Renee Green, Mona Hatoum, Jim Hodges, Glenn Ligon and Yukinori Yanagi signal a politicization of fabric and texile work. Alfredo Jaar at Galerie Lelong in New York. Steve Rockwell views the 1994 Rwanda massacre through Alfredo Jaar's presentation of The Eyes of Gutete Emerita. Martin Kippenberger at MAK in LA. Jan Tümlir takes in Martin Kippenberger's The Last Stop West at MAK Center in Los Angeles and probes some of the myths behind the prodigious Kippenberger personality. Painting Now and Forever Part 1. Carl Skelton takes the pulse of painting at Matthew Marks and Pat Hearn Galleries in New York at Painting Now and Forever Part I. 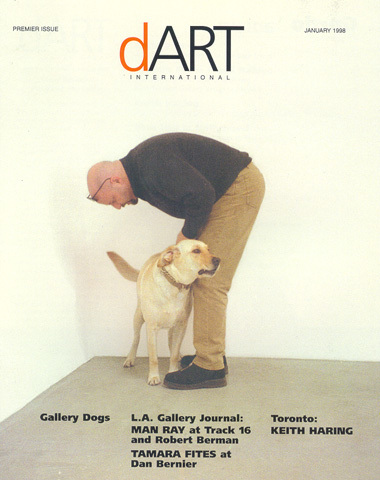 The January 1997 opening at the Dan Bernier Gallery in Santa Monica. The NY Whitney Show travels to the Art Gallery of Ontario. 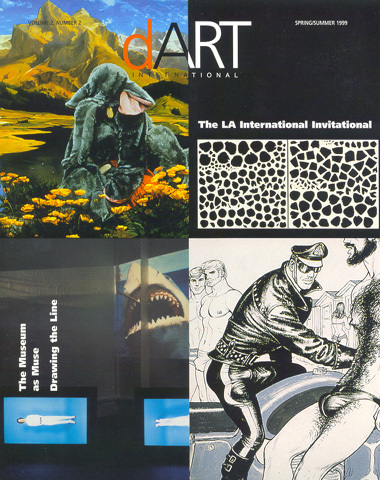 The January 1997 exhibition at Track 16 and Robert Berman Galleries at Bergamot Station in Santa Monica. 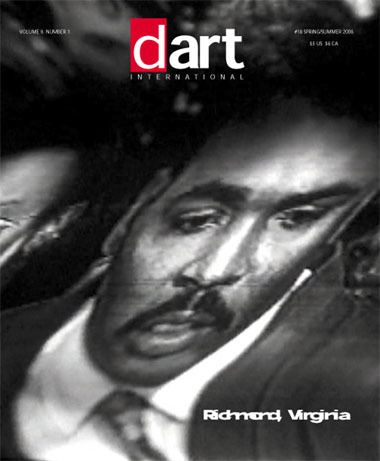 dart international magazine. 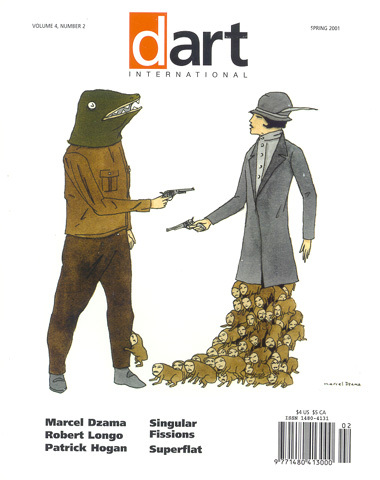 contemporary art review and criticism. ©2004-2017. all rights reserved.